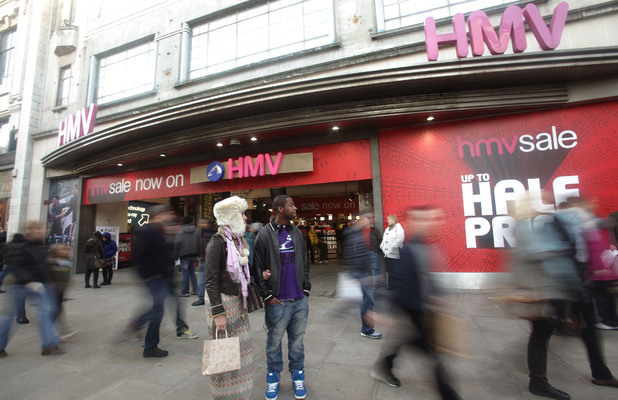 With HMV entering administration, many have cried out in a whim of desperation. Is nowhere safe? Well, kind of not, but that's capitalism right? This sense that it's a great shame and a loss to high street, to my mind, however, is rather deluded and misplaced. The top dog has been knocked off its perch. Now it would seem HMV is consigned to join other high street retailers such as its former rivals Zavvi and Woolworths and we're all supposed to be sad about it. But HMV basically got what was coming to it. After near killing independent record stores, retailers such as HMV, Our Price and Virgin Megastore enjoyed huge success throughout the '80s and '90s when overpriced CDs were the norm and mass sales and what Garry Mulholland excellently describes as the "Warholian nightmare of art as marketing" ran amok (across the '90s in particular, where the coveted number 1 spot on the singles chart was filled each week by a different entrant - much to the delight of the major record companies, themselves now falling victim to the new era in music). So all of those minor, independent retailers in towns and cities across the UK closed their doors, teary eyed at the loss of their livelihood while HMV recorded record profits and ushered in new media forms such as Mini Disc, DVD and Blue-Ray onto their shelves throughout its later life and tape and CD in its earlier life. HMV (and associated others), however, never quite cottoned on to the most profitable form of new media until it was too late. Digital music and video (MP3 and MP4 etc.) stored onto computer memory and latterly in cyberspace would see to the demise of high street chain stores in a way akin to how they had killed the local record store originally - which is, interestingly enough, doing better these days than it has in years. The MP3 became the new CD and iTunes became the new HMV. Equally, ready to kill off the old HMV, by selling the media it did at a cheaper price, were the likes of Amazon, whose inexpensive rented warehouses in the sticks would house their shipping led-businesses to record extremely high margins. Meanwhile HMV sat there on the high street, lying in wait, paying a large lease fee for the pleasure and selling next to nothing in relation. But HMV's bosses didn't give a damn when they were wiping out record stores. Remember that. In fact they courted it and everybody sat around rather unworried by the whole affair. In some kind of microcosmic representation of the western world outside it, HMV bullied its way around and was deemed too big to fail (if one cannot see the comparison to be made with Lehman Brothers or even the USA itself here, then one should open one's eyes). It seems as if the zeitgeist now is to accept the mega brand as the norm and to see a bunch of small, relatively equal retailers competing with each other as arcane and dead. It's a funny view on capitalism to have, to see this even as capitalism. Surely all of that free enterprise and varied choice, a true market, if you will, is the capitalist way. Surely, having just one large, overbearing oligopoly owning the high street in its particular niche is as anti-capitalist as one big dictatorial leader ordering subjects to do as told. Reel Big Fish - Sell Out. Seems apt. We should surely applaud of the demise of HMV then. We who became so attached to a dog and a phonograph - while the owners got fat and overcharged us for so long - should be glad to be rid of this autocratic despot of record and video sales on the high street. Consumer power won again, right? Well, not when we consider that now the bully boys are Amazon and iTunes and there is little we can do to stop them from doing what they want (think corporate tax payments in Britain). As one clever Palestinian once called his people "the victims of the victims", so now can those giants such as Amazon and iTunes call themselves 'the killers of the killers'. We can all sit back downloading for free or as close to as possible, while HMV dissapears (which, as history shows us, it is now quite likely to do). I should try and cash my HMV card reward points in if I can (such hypocrisy).